Our 14th Season marks a nice new step in student involvement. Part of the Riverfront mandate is to provide our students with “the resources, tools and leadership to produce, promote, market and perform live theatrical works.” In the past, that has involved a lot of acting, singing and dancing, a bit of set construction, a fair amount of prop and costume work, one on-stage performance of a musical instrument, and, for one student, a lot of writing. 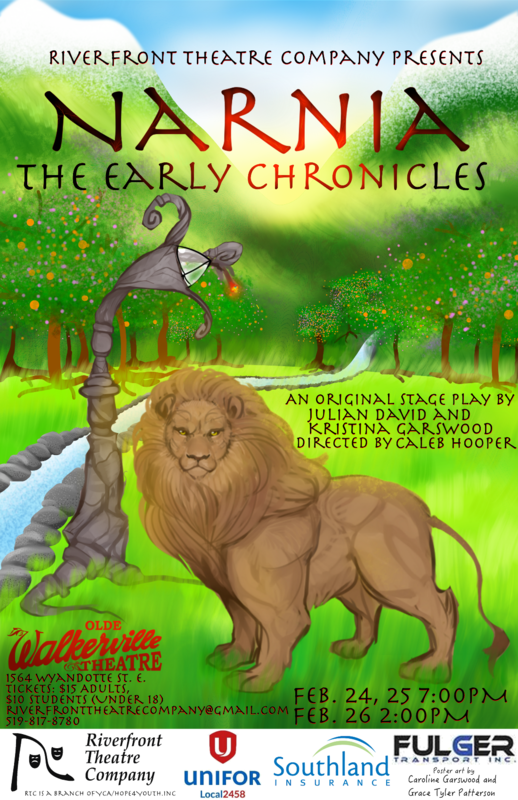 This year, Julian David (15 years) stepped into the writing arena, co-writing a fresh adaptation of Narnia: The Early Chronicles for this year’s production. Julian is in his third year with Riverfront. Earlier this season, you may have seen that we adopted the artwork of one of our Seniors, Anne Garant (14 years), now in her third year with Riverfront, for our RTC t-shirts for the season. Those t-shirts are now in, and being proudly worn by the Seniors and Juniors of Riverfront Theatre Company. Kudos to Anne for developing the “No Penguin Left Behind” shirt, in response to our general viewpoint that Riverfront Theatre Company is A warm place for cold penguins. In another delightful move, we have the first RTC student-designed poster! Caroline Garswood (18 years), who has been involved in Riverfront Theatre Company since the fall of 2009, has co-written five scripts for Riverfront. This is her final season as an actress with RTC, and her first season as an Assistant Director (for Princesses Aplenty, one of the plays she has co-written for the company). She designed the poster for Narnia: The Early Chronicles, in which she plays the role of the White Witch, along with her friend, Grace Tyler-Patterson of British Columbia. The poster was designed with Sketch-Book Pro with artwork contributed by both young women. Several Riverfront students will be taking the stage with instruments in hand this year, to play along with live accompaniment for Princesses Aplenty. Details of those exciting pieces of news will follow! Riverfront Theatre Company is proud to have the opportunity to highlight the artistic contributions of our young artists! Previous: Previous post: Announcing: The Cast of Princesses Aplenty! Next: Next post: The Riverfrontiers Strike Again: Bowlathon 2016!